Extremely hardy evergreen shrub that holds its color year round. Dwarf, low spreading, staminate form which tends to build up in the center with age. The main branches are strong and horizontally spreading with short, upward-reaching branchlets. Foliage is soft and greyish-green. Resistant to juniper blight. Grows 2 to 3 feet high and 10 feet wide or more. 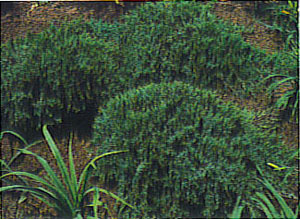 Nice foundation plant against large bare walls or useful in mass plantings. Tolerates hot, dry locations. Little maintenance required when established.